On the 1st of august 2016 we were playing footgolf and having fun like every other footgolfer in the world. I lost my scorecard and me and Tristan started a conversation about how irritating it can be when you have to write during a practice round. We were searching the internet and found only a few "golf" websites and apps. We tried some and made some accounts but it was all too difficult and too much aimed at golf. 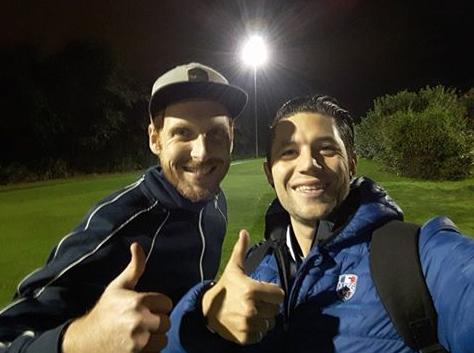 "why isn't there something for footgolf then"
After we finished the rounds we were shouting to each other what scores we had and after everyone was finished and we collected all the scorecards, some wet from the dutch rain and some players have the worst handwriting ever. We went home and one of us typed all the scores into the computer to finaly have a good look on what the score were. How is it possible that the best game ever invented does not have something of our own? For the footgolfers by the footgolfers. A good website were we can fill in de scores and see what the rest did on this course. That isn't that hard right? "right"? Tristan said: "I am a developer and ofcourse it is possible. But it is not easy man". After that day we sat together and we talked about a footgolf community. We called vincent(also a developer) and asked him if he could give us a hand. He turned out to be correct. It was hard but we have worked on it almost every day sinds then to have this website done before season 2017.